I have loved cats ever since I can remember. I used to carry my favorite kitty around (sometimes by the wrong end according to my parents hehe) and sing them songs. I've always felt so connected to my feline friends and they have always warmed right up to me. As a child my cats always followed me around everywhere. Such wonderful memories of my favorite animals. My cat Scratchy was born the summer before I was married over 10 years ago. She was the fluffiest kitten of the litter and as soon as I saw her I knew she would be my baby. I've loved and spoiled her ever since! Several years back I found out that my husband was very allergic to cats. My beloved princess Scratchy had to move into my parents home. My parents decided that she would live outdoors on their small hobby farm. I had never had Scratchy declawed and so the outside life has been serving her very well. 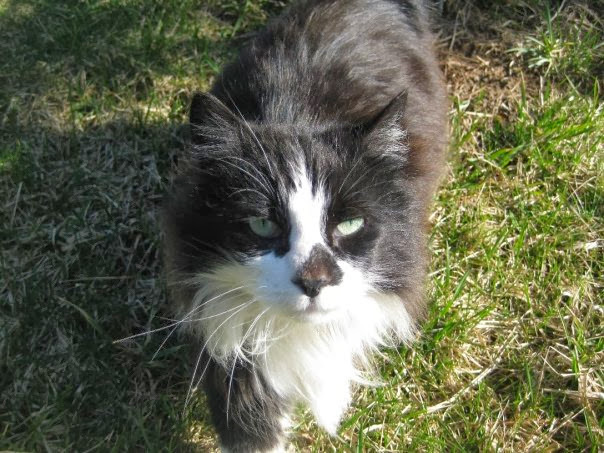 She is happy and well fed, she plays in the warm sun and lives just the most perfect kitty-cat life in the country. One habit from her pampered indoor life that could not be broken was her love of the litter box. She will only use her box and my parents keep it clean for her in their garage which is also where she sleeps every night in her warm kitty bed. My parents have been using a generic clay litter but I have noticed some unpleasant smells coming from it! I wanted to bring them a gift of the new Fresh Step with Odor Shield cat litter so that they could literally smell the difference. I know Scratchy will be a much happier cat without that smelly litter. So off to Sam's Club I went to buy the new litter. 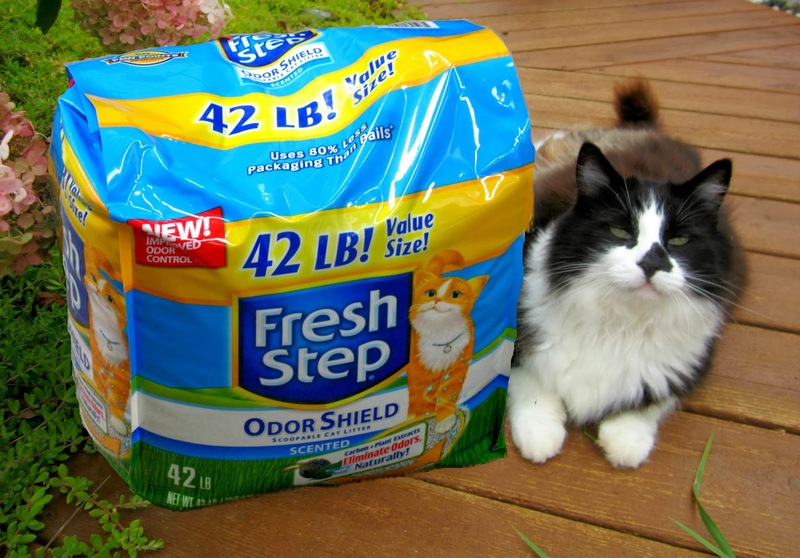 The new Fresh Step with Odor Shield club size is 42 pounds of awesome. This nifty cube shaped package comes with a stretchy handle that pulls out of the bag. The handle makes the package of litter so easy to transport. The bag also sports a zipper opening so that you can keep the litter where the litter needs to stay in between box refills. Another bonus with this bag is the 50 Paw Points which is actually doubled right now through October 31st 2013. All you have to do is go to Fresh Step and when you enter your points select Sam's Club from the drop down menu. Paw Points are fun because you can redeem them for some really great stuff! My baby really loves her new litter and my parents love the fresh scent. The natural plant extracts (chlorophyll) and essential oils keep her box smelling fresh and clean. The chlorophyll acts as a sponge to soak up odors and the essential oils stop the growth of bacteria. No more stinky kitty litter box! Now her carefree kitty life can go on. Have you ever heard of cat bearding? Well I hadn't until I found out about a contest where you can win a $1000 prize pack including a $300 professional photo session with the winner and their cat and a $700 Sam's Club gift card! To enter you can go to this linky until 9/30 to submit your photos. I tried my own hand at cat bearding. Scratchy did not enjoy the idea, she just wanted to be scratched and petted but she still gave in a little. I grabbed a few cat treats to give her which made her a bit more flexible to the idea. Cat bearding is simple in theory. All you have to do is follow this helpful tutorial from Stephanie at Mommy Musings here to make it easier. ...and here is a fun little Vine video of my kitty Scratchy! She loves to purr and talk to me.